Wedding planning can be a gruelling task for brides who want to do it themselves, especially when it comes to choosing decorations for the reception. Crafty brides can let their creativity shine and make their own wedding table decorations to give their receptions a personal touch. The centerpiece of the wedding table says a lot about a couple. The piece makes a statement if a couple is formal, fun, quirky, artistic or in love with the simple things in life. Centerpieces are essential to wedding table decorations, and there are many ways a bride can create her own. Most centerpieces utilize flowers to varying degrees. Brides should choose flowers depending on the wedding’s season, with as few or as many as they prefer. For a more casual and down-home touch, use mason jars instead of proper vases to hold smaller amounts of flowers. Wrap the jars in pretty ribbon tied in a bow, or use tissue paper that matches the wedding colors. You can also use glass stones, small rocks or even marbles. The same tricks can be used for inexpensive glass vases that can be bought at craft stores. Brides may also consider purchasing unusually-shaped or fluted vases at home stores to hold a bouquet, or even single flowers, to provide a striking and dramatic table centerpiece. Floating candles are an option that use little to no flowers for brides who prefer a more minimalist style. Find large bowls, clear or in pretty colors, and fill them at least halfway with water. Floating candles can be placed in each bowl to provide an elegant table centerpiece that will shine soft light on guests. Change the color of the water, particularly in clear bowls, using food coloring to match or complement the decor. A third simple and classic touch is the use of wicker or woven baskets on wedding tables. Use small baskets to hold things like mints or nuts. Larger baskets can be used as actual centerpieces when their handles are wrapped in ribbon and flowers are placed inside. 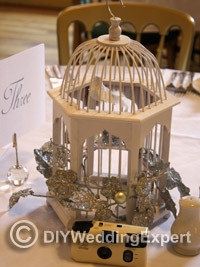 One final and very simple idea is to use multiple photos of the bride and groom as the wedding table decor. Photos can be recent, such as engagement pictures, or can depict the bride and groom as babies and on throughout their lives both separately and together. A little planning, some creativity and a trip to the local home decor or craft store can help any bride make her wedding a personal affair. With homemade table decorations, the styling will be one-of-a kind and will truly reflect the personalities of the couple.